After suffering from the worst drought in recent history, Cape Town's dams are nearing 70% of storage capacity - a significant improvement from the 38% capacity recorded at the end of the previous winter. "The very low supply storage resulted in the imposition of Level 6B water restrictions in February 2018," Neilson said. "The enormously positive response from Capetonians when called upon to reduce water usage, as well as advanced pressure and water management programmes by the City, saved the say and Cape Town avoided the worst-case scenario." "At Level 6B, our overall target was 450 million litres a day - we never reached it. We are now at around 500 million litres a day. The ideal situation is to stay at 500 million litres, which is still our target under Level 5," she said. "We are not encouraging people to use more, but with the 500 million litres comes a different target. People are already using more than 50 litres per day, we are just charging the right price now to come in overall at 500 million litres per day." "The relaxation of restrictions is a moderate proposal that is based on hydrological risk assessment that indicates that it is safe to do so at the level of risk that is agreed upon," Neilson said. 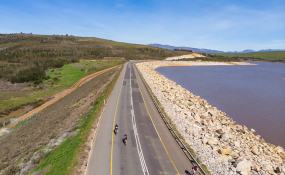 "Of course, the amended Level 5 restriction guidelines for water usage will apply and we are confident that the significant behavioural change that we've seen pertaining to water conservation will prevail to a large extent." "We would have preferred to get a response, but we have not received a response," he explained. "We just have to come to a conclusion that they are unable, in the decision-making process, to come to a quick conclusion on this. On the other hand, we saw no purpose in continuing with the Level 6B restrictions because there is enough water in the dams."